Around here, we believe that highly fragrant and fresh spices can greatly influence the quality and taste of the finished dish. Fennel Pollen is one of those ingredients that can actually make a real difference! If angels sprinkled a spice from their wings, this would be it. 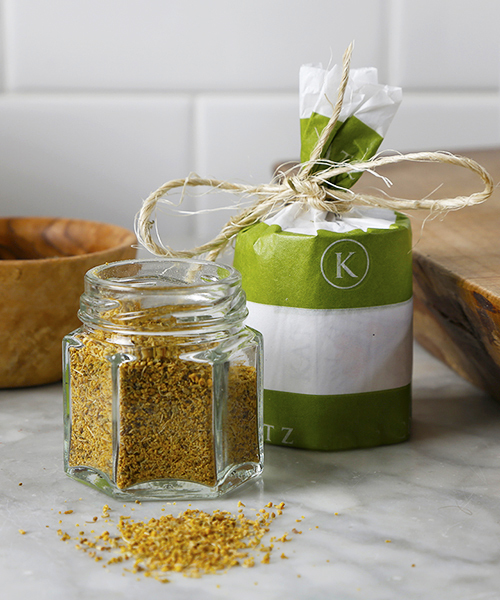 Our KATZ Organic Fennel Pollen is harvested in California. It has many uses from a rub for salmon or chicken, or try it on our KATZ Aromatic Pork Loin Recipe. It is a great addition to pasta and risotto dishes and can be either added to your sauce or sprinkled on top for a heightened fennel flavor. It also stands up to many grains including farro and quinoa, which is actually a seed and considered a super food; check our our KATZ Quinoa Salad Recipe...really healthy and really good! It marries very well with KATZ Extra Virgin Olive Oil drizzled on a toasted crouton and sprinkled with fleur de sel with a pinch of fennel pollen…darn near magical! Or, try our KATZ Smoked Trout with Apple and Fennel Pollen recipe next time you need an appetizer for guests. And don’t forget the sweets…from cookies, to muffins, to coffee cakes, and scones…all are enhanced by this magical spice. Please check out our tasty dessert recipe KATZ Fennel Pollen Apple Cake...This spice is great on just about everything!